I remember as a kid reading about religions that believed in multiple Gods and thinking how silly, almost barbaric, that was. Everyone knows there's only one God. Hello! Then I would laugh sardonically, even though I didn't know then, and don't know now, what sardonically meant. I'm seeing a pattern! I knew nothing about one God or multiple, but it didn't stop me from judging. I never learned a thing about Hinduism growing up, but the paltry number of Gods in the Greek and Roman mythologies that I did study pale in comparison. Hinduism is said to have 330 million Gods. You can buy books that are filled with nothing but the various names of God. I could think of worse books to read..
A young boy here blithely commented that "God is one, but he has many faces." 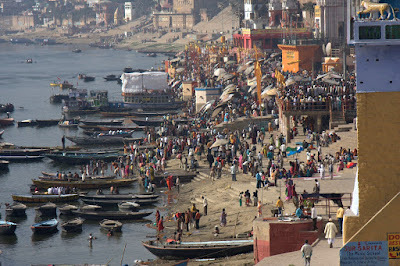 Of the many faces that are worshipped faithfully here, Shiva is the probably the big dog, and Varanasi is his city. So when the annual festival of Shivaratri comes ("ratri" means night - Shivaratri, then, is the night of Shiva,) it's a Big Deal. 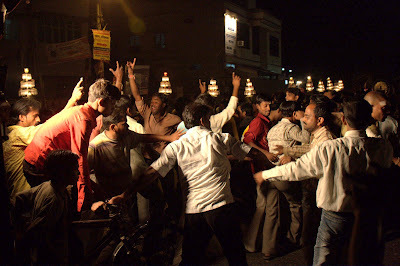 Religious celebrations in India are ear-splitting affairs, and Shivaratri is probably the ear-splittingest that I've lost hearing in. There is a giant parade of children dressed as Gods, monstrous elephants, and rolling discos that will make your ears bleed. I wonder sometimes what India must have been like only 100 years ago, when the loudest sound you could make would be ringing that huge bell or clearing your throat like that guy on the bus the other day. It's considered "good merit," basically good karma, to crank the volume when worshipping. So priests will broadcast their off-key singing to the entire neighborhood, even though it's four in the morning. We innocent tourists can't understand why we're the only ones who even notice how loud it is, or think it should be quieter. The locals never seem to mind. On Shivaratri, it's considered a religious sacrament to drink "bhang lassi," a yogurt drink mixed with powerful marijuana. On that night ashrams are pouring them out of huge vats and giving them to everyone, including families with young children. I didn't see any young people who looked out of it, but I saw more than my share of young men, gyrating wildly to the disco soundsystems. Look at the photos - you'll see a few. This rambling story has come to an end, because I have to catch a train tonight. A group of us are taking an eight-hour night train, then a two-hour jeep ride, to a Christian ashram, of all places, for a 17-day silent meditation retreat. I'll be back on e-mail in about three weeks time - around April 7th or so.